Epithelium: Stratified squamous keratinized. Atlas of Plant and Animal Histology. Put the cursor over the mouse to see where the image comes from. Technique: Haematoxylin-eosin, 8 μm thick sections, paraffin embedding. Stratified keratinized epithelium is typically observed in the epidermis of land vertebrates, but it is also found in the papillae of the tongue, oral palate and esophagus of some animals eating hard food. 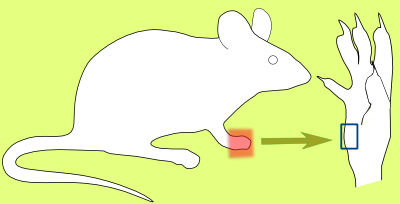 The strata of the epidermis can be clearly observed in the image above, which is from thick skin of a mouse. Stratum basale. Cells in different mitotic phases. The stratum basale (also known as stratum germinativum) is the inner layer of the epidermis. It is one cell thick and is in contact with the basal lamina. In this stratum, epithelial adult stem cells proliferate and give rise to keratinocytes that will form later the upper layers. In the image on the left, several proliferating cells can be observed in different mitotic phases. In the stratum basale, some cells remain as proliferating cells, whereas other cells start to differentiate, synthesize keratin filaments (types 5 and 14), and migrate to the upper layers. During this travel to the surface, cells become part of the different layers of the epidermis. Actually, each of the epidermal strata is a layer of cells at the same differentiation stage. The stratum spinosum is the thicker layer of the epidermis. It contains polygonal shaped cells that, as they get closer to the upper layer, become flattened and synthesize new keratin isoforms (types 1 and 10). These cells show cell membrane interdigitations that look like spines when they are observed at light microscopy. That is why this layer is called stratum spinosum. However, these spines are artefacts because the histological processing causes a general retraction of cell cytoplasm but not at the places where the interdigitations are present. The stratum granulosum contains 3 to 5 layers of flattened cells that show their cytoplasms filled with basophilic keratohyalin granules. Because this stratum shows a strong basophilia, it looks darker after standard tissue staining. The content of the granules will be needed for later cytoplasmic keratin aggregation. 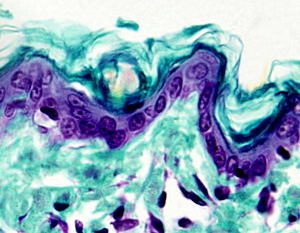 Image of a keratinized stratified epithelium from a thin skin where the epithelial strata are hardly distinguishable. However, basal lamina is clearly observed (black arrows). PAS-haematoxylin stains the basal lamina in red-pink color. Finally, the stratum corneum is composed of dead cells filled with keratin. The function of the stratum corneum is to protect the skin against abrasion, dehydration, and pathogen invasion. Peeling occurs in the more superficial part of this stratum, more or less at the same ratio than new cells are joined to the layer from the stratum granulosum. The thickness of the stratum corneum may change depending on the part of the body where the skin is located. In those parts of the body where mechanical stress is frequent, such as scrape or abrasion, a thicker stratum corneum can be found. A specialized extracellular matrix is covering the deeper part of the epithelium, referred as basal lamina. 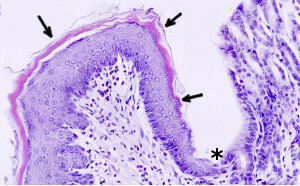 It is not observed in the image above, but it is shown in the image on the right, where the basal lamina is observed after PAS-haematoxylin staining (black arrows point to basal lamina). The underlying tissue is called dermis, which is dense irregular connective tissue. The surface between epidermis and dermis is sinuous. 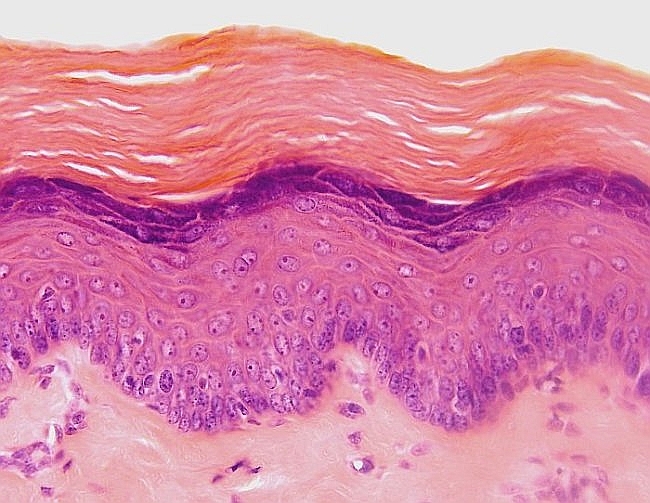 The image above is a cross section view of interdigitations between epidermis and dermis, which are called dermal papillae. It increases the adhesion strength between the two layers of the skin. Thick skin from the palm of a rat hand. Stratified keratinized squamous epithelium is very thick, dermal papillae are highly developed, and stratum corneum is thicker than in other body places. 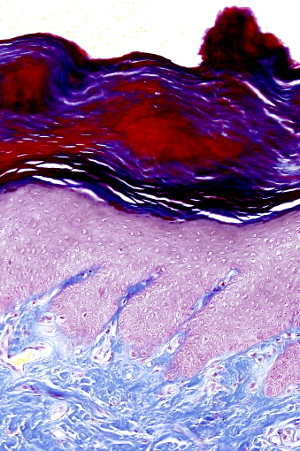 The bluish color of the keratin on the upper part, and of the connective tissue in the lower part, is because of the staining protocol. Skin of the upper lip of a rat. The epithelium is so thin that the differentiation of keratinocytes occurs almost in one layer of cells, although the stratum corneum is present. The esophagus of animals eating hard food contain a stratum corneum (arrows). Asterisk indicates the transition between esophagus and stomach.